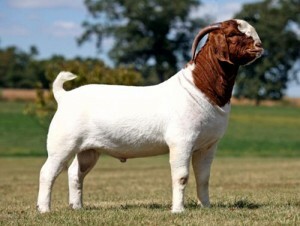 The Boer is an improved indigenous breed with some infusion of European, Angora and Indian goat breeding many years ago. Several researchers agree that the indigenous populations were probably from the Namaqua Hottentots and from southward migrating Bantu tribes. The name is derived from the Dutch word “boer” meaning farmer and was probably used to distinguish the native goats from the Angora goats which were imported into South Africa during the 19th century. The present day Boer goat appeared in the early 1900′s when ranchers in the Easter Cape Province started selecting for a meat type goat.